I Put Pants on for This? 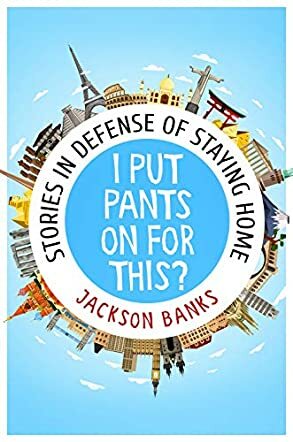 Stories in Defense of Staying Home is a collection of humorous short stories written by Jackson Banks. The author begins his narratives of funny stories masquerading as fiction (but often containing massive chunks of reality) with a description of his family’s move to Cuba when he was eight years old. Marine Corps Air Station Cherry Point in North Carolina had been an idyllic place for a boy to grow up, filled with woods and trails for him and his friends to explore. When his father announced his reassignment to Guantanamo Bay in Cuba, all Banks could think about was losing his friends, his fort in the woods, and watching the Blue Angels practice overhead each year. Guantanamo Bay was alien and strange. While their plane passed over translucent, sparkling blue waters where dolphins played, the actual base was more of a scrubby desert. Tarantulas, scorpions and banana rats numbered among the significant wildlife encounters he and his family would enjoy. Cuban rock iguanas, who had a penchant for hot dogs, were likely to sneak up on an unwary picnicker and make away with their lunch, hot dog bun and all. I Put Pants on for This? had me hooked with that opening story, “I Went to Cuba, and All I Got Was This Lousy Voodoo Curse.” Banks had a huge challenge with me as a reader. I’m not really a fan of humor and frequently just don’t understand comedy. That said, I sat entranced, voraciously reading his stories and laughing out loud like a loon, and I actually had a grand time throughout. Banks has a sharp and insightful sense of humor, and an intuitive gift for comedic timing. The only breaks I took from his performance was to Google irresistible items such as the banana rat, and when I’m involved enough in an author’s work to start working interactively with it as I read, that’s a very good thing indeed. Banks’ writing is conversationally smooth and a joy to read, and the different locales covered in this collection add an ample dose of travel and adventure to the mix as well. And yes, New York City subways are that bad. I Put Pants on for This? Stories in Defense of Staying Home is very funny indeed, and it’s most highly recommended.